Commercial real estate broker Jed Dousevicz unlocks the front door of the unoccupied Delano Administration Building and lets a small group of prospective buyers inside, along with a journalist and a photographer. At first glance, the building doesn't look vacant, more like the owners are running errands and due back shortly. 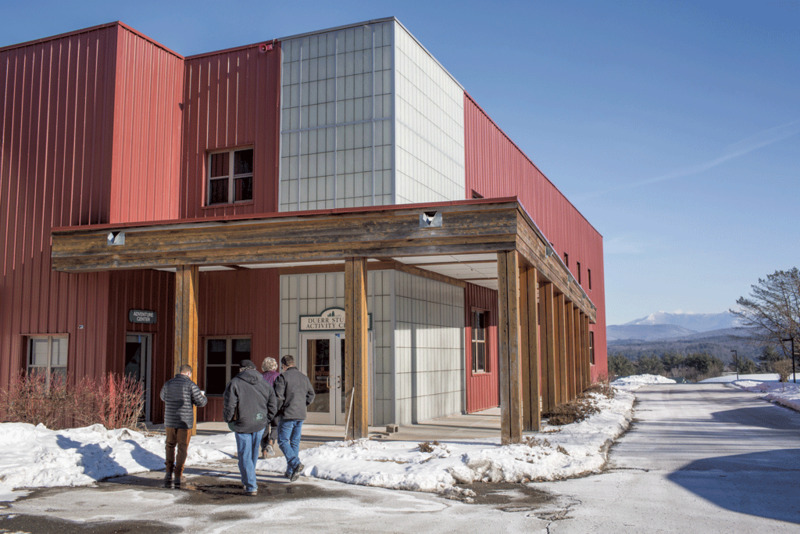 But the longer we explore this structure — and 13 others on the sprawling, 128-acre Pine Ridge School campus for sale in rural Williston — the more it feels like the previous tenants actually bolted on short notice, as though fleeing deadly contagion. Indeed, the administration building, like most of Pine Ridge, looks tailor-made for shooting a zombie apocalypse movie. Framed pictures still hang on the walls. Desks and filing cabinets are littered with yellowed notebooks and blueprints. Sweaters and jackets still hang in a closet. An American flag stands in a corner behind the reception desk, where a telephone and message pad seem to await incoming calls. "It's kind of spooky," observes Amy Demetrowitz, director of real estate development for Champlain Housing Trust. She's on the tour, along with CHT chief operating and financial officer Michael Monte, to eyeball the property for potential development ideas. Dousevicz agrees. His firm, V/T Commercial, has been trying for years to sell this property on behalf of its client, People's United Bank. "It's like they shut the lights off, walked out and never came back again," he says. Until five years ago, this wooded and hilly campus, with its stunning views of Mt. Mansfield, was home to a private boarding school founded in 1968 to educate teens with learning difficulties, primarily dyslexia. At its peak, Pine Ridge employed more than 100 faculty and staff and had an enrollment of 115 students. As many as 98 students lived on campus year-round in three spacious, modern dorms. But by the early 2000s, many students with learning disabilities had been mainstreamed into public schools, and Pine Ridge fell on hard times. 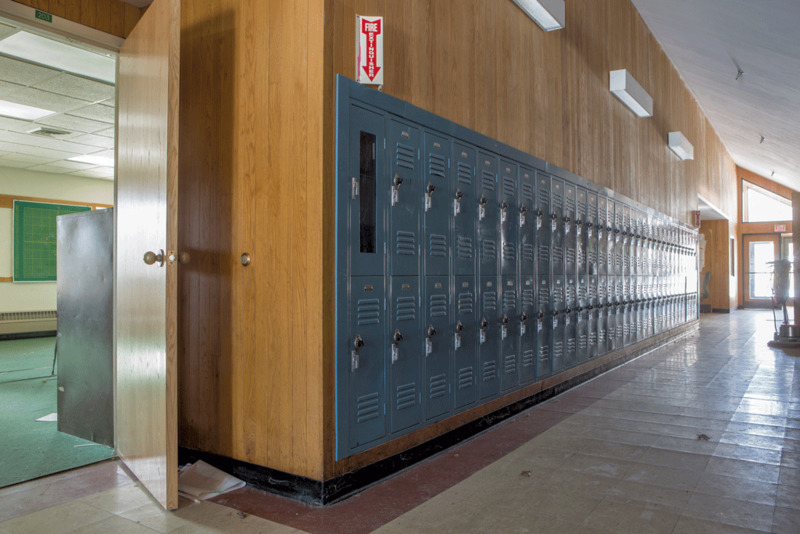 As public funding for private schools dried up and a dwindling number of families shelled out the $56,000 annual tuition — day students paid $27,500 — the school began opening its doors to kids with emotional and behavioral difficulties. In the words of its last board of trustees, Pine Ridge "drifted far from its original mission." In 2006, trustees hoping to save their beleaguered institution hired headmaster Dana Blackhurst, a wealthy, well-connected and controversial special educator. When Blackhurst arrived in April 2007, he inherited a drastically diminished enrollment and $1.4 million in debt. He tried steering the school back to fiscal solvency, in part by cutting staff and slashing tuition to attract new students. But the school's downward spiral was irreversible. In March 2009, Blackhurst announced that Pine Ridge would close permanently that June following its graduation ceremony. The campus has remained vacant and unused ever since. During our tour, the second conducted that day by V/T Commercial, Dousevicz explains some of the challenges of selling this attractive but complicated real estate. People's United Bank foreclosed on the property at a time when the national real estate market was deep in the toilet and few buyers were interested in a $3.5 million price tag. Moreover, because the entire campus sits in Williston's agricultural/rural/residential zoning district — an area designated for minimum development — its uses are limited. Current zoning laws would allow a developer to, say, scrape the land bare of all existing structures, then build luxury homes on 2-plus-acre lots — an expensive and impractical option. Much of the land is mapped as deer wintering area, further hindering new construction; other areas are steeply wooded hillsides. In short, Dousevicz says, virtually the only practical way to use the property is as the site of another school, hospital or house of worship. Considering the facilities available — and the discounted price of $2.8 million — a school or hospital seems the likeliest candidate. Dousevicz leads us downstairs to the Beal Dining Hall, where plates, bowls, trays and silverware are stacked on shelves and rolling carts, seemingly awaiting an incoming lunch crowd. The dining room features a beautiful stone fireplace that looks like it hasn't been used in years. In one corner sits a vintage Ms. Pac-Man arcade game. In another stands a pool table with a scatterplot of billiard balls, as though a game were still under way. We exit the building and walk down a long, paved road, past a series of mostly one-story clapboard structures and gray, oddly shaped "pods" that lend this part of campus a summer-camp aesthetic. Later I learn that, in addition to the soccer fields located along the Winooski River, Pine Ridge's ropes course remains untouched. As we climb a staircase inside the Hopwood Academic Building, that end-of-days vibe grows eerily strong. On the second floor, each member of the tour fans out in a different direction. I explore a row of offices and classrooms, marveling at the abundance of books and other educational material left behind. 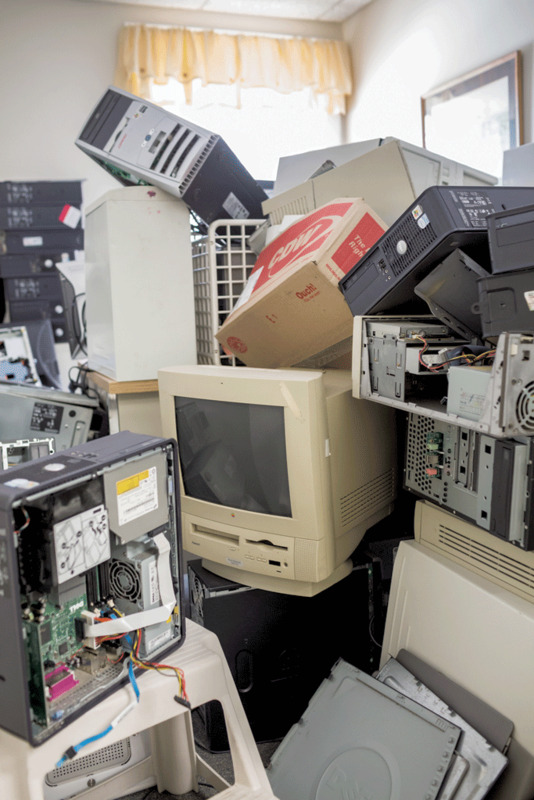 In one room sits a pile of 20 to 30 laptops and their carrying cases, all in mint condition, at least for their day; according to Dousevicz, all their hard drives were erased years ago. In another room, numerous world maps hang on the walls beside a brand-new smart board. In another, a small library houses hundreds of books. As our group reconvenes outside, Monte remarks on the ample resources seemingly going to waste inside. "It's hard to tell how much of it has value," he says, "but it must have some value to someone." Dousevicz leads us to one of the newer and more impressive buildings: the Duerr Activity Center, a 9,562-square-foot, multiuse, climate-controlled athletic facility. Just inside, we pass several glass cases with trophies still on display. Beyond them is the gymnasium itself, huge and in pristine condition. 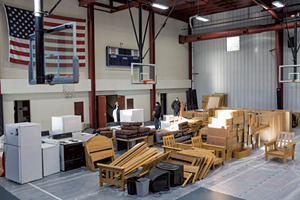 The basketball court would look even bigger were it not covered with furniture neatly stacked in rows: rod-hockey tables, workout equipment, mattresses, refrigerators, microwave ovens and chests of drawers — more than 25 bedroom sets in all. In its current state, the court could easily be pressed into service as an emergency Red Cross shelter. Dousevicz explains that nearly all the furniture was evacuated from a nearby dorm, which flooded during one of the recent "named storms." Outside, we continue down the hill, passing a small school bus, two newer-model pickup trucks and an enclosed trailer. All were once owned by Pine Ridge but never auctioned off by the bank. Dousevicz confirms that they, too, would be available to a purchaser. We visit two last buildings on our tour: the Mansfield and Sterling dormitories. Constructed in 2004, these two-story dorms feature single and double rooms as well as several two-bedroom apartments. Together, they're large enough to house more than 60 students and residential advisors, though Dousevicz doesn't have an exact figure. Sterling looks much as it did when the students departed, which makes it all the creepier inside. Some of the beds still have blankets and sheets. Several kitchens have dishes in the sink; the bathrooms, soap in the shower stalls. In one room, someone left behind a Schwinn mountain bike in fairly good condition. Another offers faded copies of the New Yorker, and art projects bearing students' names on the walls. In a central lounge, I spot an oversize TV remote with extra-large buttons, presumably for kids with dyslexia. On a shelf sits an anatomically correct dummy for teaching CPR. As we make our way outside and back to our cars, Dousevicz explains how the search for buyers is going. "Our marketing right now is national," he says. "I wouldn't say there's one typical user, but we've had a lot of inquiries." As members of our group brainstorm potential uses of the property — senior housing, a psychiatric facility, a drug-treatment center — Dousevicz notes that one such idea was already considered, and withdrawn, two years into the process. In November 2011, Maple Leaf Farm Associates, the Underhill-based drug treatment center, signed a purchase agreement to buy the property for an undisclosed sum. As executive director Bill Young explains, the nonprofit sank nearly two years and more than $200,000 into exploring the feasibility of opening a 96-bed inpatient drug treatment center at the former Pine Ridge. What killed the deal? Nothing about the property itself, Young says. However, the cost of renovations quickly crept above $300,000 — more than Maple Leaf was ready to spend. Then there was the costly and time-consuming process of getting approval from Williston's zoning board, selectboard and development review board, all of which, Young says, added months to an already cumbersome review process, if not years. As he puts it, "I don't think we would have been done yet." Matt Boulanger, a senior planner in Williston's Planning & Zoning Office, admits that Maple Leaf faced challenges, among them a small but vocal group of residents who opposed a drug-treatment center in their vicinity. But, Boulanger notes, any potential buyer will have hurdles to overcome — with or without offering outpatient services to drug addicts. "It's a big, complicated property," he says, "and that's going to slow things down for anyone." V/T Commercial's leadership certainly hopes not. As of last week, the firm had seven offers in hand, according to agent Brad Worthen. While Worthen won't disclose the potential buyers' names, he says at least one proposes a school on the site. "Hopefully, it will return to some value in that vein," he says of the desolate former Pine Ridge. "It's an absolutely gorgeous piece of property, and it's a shame to have it go to waste." The original print version of this article was headlined "Campus Lifeless"